The question of whether or not the distilleries of E. E. Gouge & Company, located in this city, will be permitted to continue indefinitely under the bond given by the Company some months ago, following the seizure of the distillery by Deputy Revenue Collectors Bowers & Pritchard, will be determined during the May term of the Federal Court at Abingdon. The defendant Company has been summoned to appear in court at the May term and show cause , if any, why the property should not be taken by the government in accordance with the seizure, when it was alleged that the Company had violated the Internal revenue Laws in several particulars. Those who are summoned as witnesses in the case are: E.E. Gouge, W.T. Sams, W.H. Smith, J.P. Young, W.H. Crowell, M.R Miller, and Gordon Aronhime. The Cpmpany has had its plant in operation ever since it was permitted to rebond by Judge Henry C. McDowell. The property is all being held subject to an attachment pending a final hearing in the case. The Martin Lynch Co. Inc. applied to the Corporation Court on Bristol, Va. Monday for a malt liquor license. The license was granted. The annual tax is $1000.00 per year. The only other license of that kind is held by Heller Bros. , which recently bought the malt liquor agency of Jere Bunting. Five years ago the Bristol Herald Courier closed its advertising columns to the whiskey trade. It was one of the first newspapers in the country to take this step, but since that time scores of newspapers, large and small, have done likewise. And still they come. The latest newspaper to bar whiskey advertising from its columns is the Chicago Record-Herald. 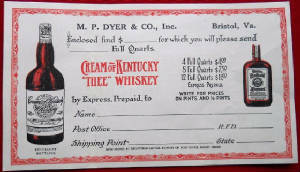 During Prohibition one could only obtain whiskey two ways: illegally or via a written Doctor's prescription. Thousands were issued at so much per. Reportedly the "rag-tag" of the medical profession went into the indiscriminate sale of prescriptions and the drug stores did a landslide business. One Abingdon business got into the business so deep, it kept a nondescript but licensed doctor on duty with a desk in the store to write whiskey prescriptions.There was generally a waiting line of persons whose medical need for alcohol could be determined by a mere glance. 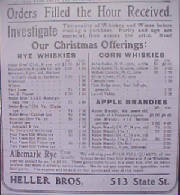 After the Repeal of Prohibition in 1933, a liquor store was opened in Bristol,VA. Mack Frazier, newly appointed head of the Virginia ABC Board, established a new liquor store in front of J.D. Faucette's store on State St. The newly opened store in no time built up the largest volume of sales of any store in the Sate of Va.
Faucette, a prominent Bristol leader of the Prohibition cause and a strong opponent of the sale of liquor even by the State, took the location of the liquor store "in his front door" as a personal affront. He brought in the fire-eating evangelist, Dan Graham and established him in a large tent to start a campaign to vote out the liquor store. (** The Law stated that a store could be voted out within 6 months of opening). The election was called by a petition signed by over 50% of qualified voters. And it was a walk away for those who opposed the store. It was swept out of business by an overwhelming majority. Some said that if the liquor store had been located in a less conspicuous location, ( other than across from Faucette's), it may have remained in operation. Meanwhile, the Abingdon,VA. store continued to operate and has been one of the highest in sales in the liquor store system for many years. ** Years before ( 1907-1909) when both Bristols went "Dry", Abingdon adopted a Dispensary System and garnered hundreds of thousands of dollars in retail liquor profits for the town coffers. (*) "Whiskey Helped Build Bristol "
**I was quoted as having said this in a 1995 newspaper article. From 1880 to 1910, both Bristols populations increased by thousands. 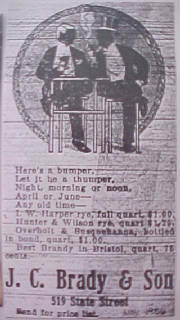 From 1910 -20....Bristol,Va. 's only increased by a few hundred.